Clip out the part of the Cd case in which the CD is kept. 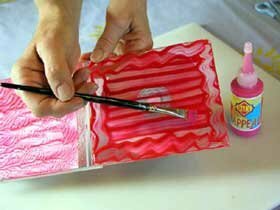 Use the Mono Print (technique 4) or brush strokes (technique 5) to paint the outside of the CD case. Press Paint Appeal onto outside of CD case and paint Paint Appeal on with a soft brush, roughly at 45º angle. Press the transparency onto it and pull off again. Press Paint Appeal onto outside of CD case and paint Paint Appeal on with a soft brush, roughly at 45º angle, for a unique effect. Finishing the Frame: Sponge with a contrasting colour onto the CD and when dry, write a note or a message, that will suit the photographs, in a fine glass liner. Stick the CD onto the right side of CD case with a good quality transparent glue. Place the photograph into the left side of the CD case.